To explore how to efficiently illustrate findings between cities when many attributes are included. Spiral plot analysis to efficiently illustrate gaps between performance and importance ratings. Performance falls below expectations for almost all public transport service attributes in each city. Note: Solid circle line is where importance and performance scores are equal; scores below this have performance below importance and scores above it have performance above importance. Spiral plot analysis provides a powerful means of understanding relative performance between cities and gaps in performance and expectations of public transport service attributes. Currie, G. & Delbosc, A. 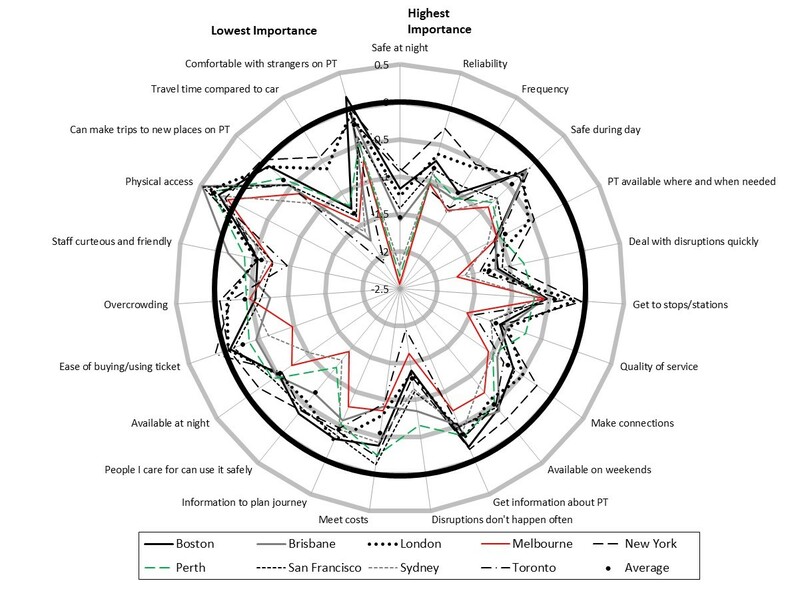 (2015) Spiral Plot Analysis of Variation in Perceptions of Urban Public Transport Performance Between International Cities. Transportation Research Record: Journal of the Transportation Research Board, No. 2538, pp. 54-64.